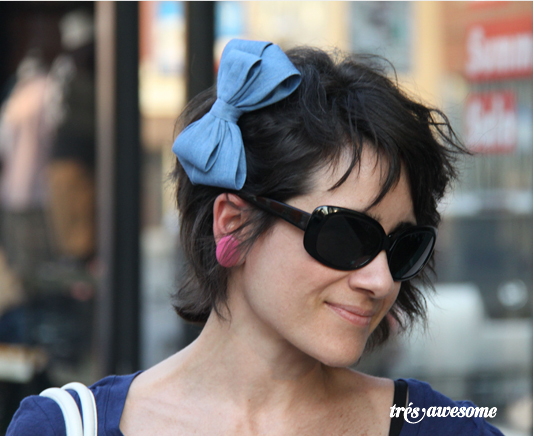 Isa looks pretty as a picture here with her denim bow and single pink plastic earring. This girl knows a thing or two about personal style. She's the woman behind Chicago Looks another great Chicago street style blog. If you haven't already, definitely check it out. I heart this flowing high waisted floral skirt with the white braided belt. LOVE. IT!!! Thanks, Emma!!! Tres tres awesome!! Love the bow - so feminine! That's pretty cool. That skirt is look so pretty and the collar is a great. outfit is perfect. Iappreciate it very much. Good luck.Regards.